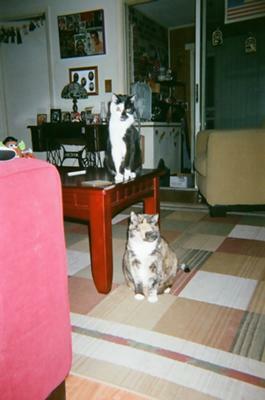 Ramone is the tuxedo & Gypsy is the calico. Ramone was 17 years old and Gypsy was 15, they were great buddies, and I take comfort knowing they are together at Rainbow Bridge. I miss them dearly, had so many fun times with them. My heart is broken. One of the things that Ramone would do is climb up the door frame and hang there for a few seconds, funniest thing I ever saw. 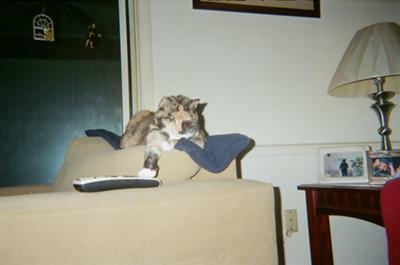 I love this picture of Gypsy, looked like she was using the remote. I'm very sorry to hear about Ramone and Gypsy, Pamela. I'm sure they're playing together at the Bridge. My heartfelt sympathy goes to you for the loss of your babies. I have 13 kitties myself and know I will have to go through this 13 more times. It leaves such an empty hole. Especially remembering the special quirks about each one. They are all very special. But in your grief, it can't compare to the years of love and devotion they gave to you. Hang on to those pics and memories. I started a memorial wall with a footprint in plaster of paris and their name and pic on the plaque. It helps to go there and remember. The Rainbow Bridge is going to be brimming full of loyal pets looking for us one day. Take care. So sorry for your loss, I know how heartbreaking it can be. They are at Rainbow bridge now, happy and contented. Please know there are many Cat Lovers that will be thinking of you. Take care.